Pawning your Antique Silver? We offer Loans on Antique Silver items! Here at New Bond Street Pawnbrokers, we provide a premier pawnbroking service to our exclusive clientele that considers to “Pawn my Antique silver”. 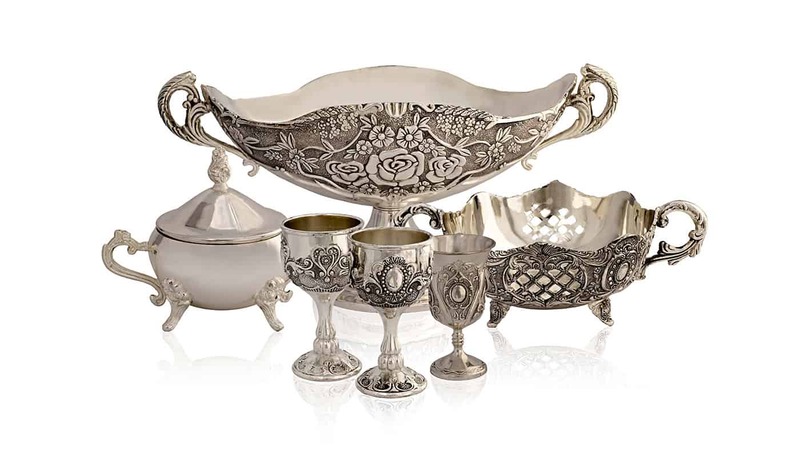 Offering instant loans on antique silver items at our London award winning shop, we ensure that the customer experience you receive is an entirely pleasant one, and that your every need is accommodated. It is our hope that we can make our arrangement as simple and straightforward as possible, and we always strive towards this end. We understand that the majority of our clients approach us in the hopes of immediately releasing funds from their property, and that’s why we make certain that the processes we follow are efficient in their achievement of this goal. One class of goods that we’re always willing to pawn against is antique silver. Timelessly lovely, this tends to hold its value exceptionally well, and there are many prestige pieces out there that we are happy to extend significant sums against. Our expert team is well versed in the valuation of such items. Possessing a wealth of knowledge to help them properly calculate costs, the loans on antique silver that they offer to our clients are guaranteed to be fair, due to the rigorousness of our assessments, and the myriad of factors that we take into account when performing their pricing. These include a multitude of considerations, most pertinently brand, style, condition, provenance, age, demand, and availability, all of which help us to achieve our one overarching ambition: to put an entirely agreeable offer on the table when you approach us for our help. Despite the extensiveness of such evaluations, it is never our intention to retain your possessions in our keeping when you borrow against antique silver. We understand that the decision to pawn your items is typically driven by a desire to hold onto them. This is something we fully respect, and just another of the reasons why we make certain that the terms and conditions we agree upon are ones that you can easily meet in order to reclaim your goods at the close of our agreement. In order to accomplish this end, our team will lend you their full support throughout the entirety of our dealings. Following your valuation, they will be happy to work with you to reach terms that suit your purposes and your financial position, and will consult you throughout every stage of the process. What they will not do is seek to hide anything in the small print, and you can trust us to keep you fully appraised at each step. Should you choose to reach an agreement with our team, the excellent customer care that we provide will continue throughout the entirety of our dealings with you. Expertly versed in the proper treatment of antique silver, we will look after your goods as well as look after you, and whilst they are in our keeping, you can rest assured that both their maintenance and their security will be prioritised by us. Consummately professional in all that we do, the New Bond Street team are always interested in lending against antique silver, and will make absolutely certain that where such a loan is made, both it and you have every one of your needs catered for until it is in your keeping again and our agreement has come to an end. If you’re interested in loans against antique silver or would like to learn more about how to pawn antique silver at out London shop, get in touch with us today. We’re always happy to help with any questions or queries you might have our about loans against antique silver, and will respond to your enquiry at the earliest opportunity. We also offer loans against the following assets: diamonds (including GIA Diamonds), fine jewellery, classic cars, fine wines (including Pétrus Wine), fine art (including Banksy and Lichtenstein) and fine watches as Patek Philippe ,Audemars Piguet or Rolex, antique silver and Hermes handbags.